File photo of a road closure. A TEENAGE BOY who was detained in relation to a hit-and-run incident in Co Kildare has been released without charge. The 16-year-old boy was taken into custody yesterday morning following a collision on Canal Bridge in Osberstown, Naas at about 8.25pm on Friday. A car struck a parked car and then hit a female pedestrian. The 51-year-old woman was taken to Tallaght Hospital in Dublin, where her condition is described as serious. Gardaí have confirmed that the teenager was released without charge yesterday evening. A file will be prepared for the Director of Public Prosecutions. The road was closed for a period of time to facilitate a forensic collision examination but has since reopened. 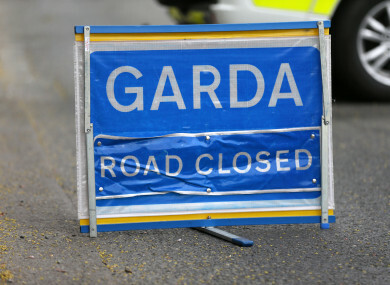 Gardaí have appealed for anyone who witnessed the collision or may have any information to contact them in Naas on 045 884300, the Garda Confidential Line on 1800 666 111, or any garda station. Email “Teenage boy released without charge after woman is seriously injured in hit-and-run incident ”. Feedback on “Teenage boy released without charge after woman is seriously injured in hit-and-run incident ”.